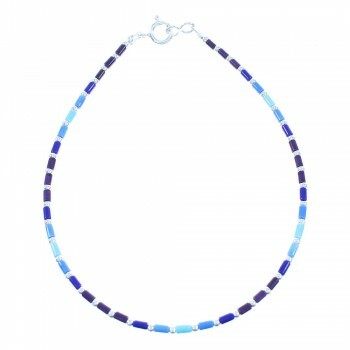 Sterling silver, man made Turquoise, Sugilite, and Lapis. 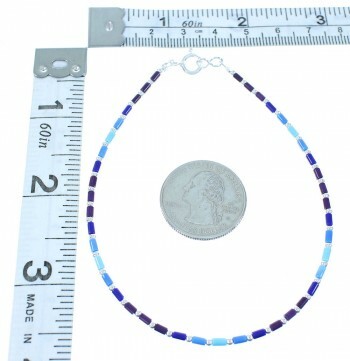 The anklet measures approximately 9-3/8" inside circumference. Excellent craftsmanship is shown throughout this amazing anklet! This radiant anklet is hand strung bead by bead out of genuine sterling silver and man made Multicolor heishi beads. The anklet consist of: 2-mm silver round beads, along with 2-mm Turquoise, Lapis, and Sugilite heishi beads. Don?t pass up this wonderful anklet!